Photo: Con Dao's best reasonably priced beachfront hotel. Most of Con Dao’s oceanfront accommodation are mediocre generic tour resorts ($700 a night Six Senses Resort excepted). Thien Tan Star breaks the mould. It is not one of these resorts and it is the best reasonably priced beachfront hotel, ideal for those who want to be a few steps from the water. Unlike some of the others resorts in town, this hotel is directly on the beach, not across the road from it. The best rooms are undoubtedly the "sea view" editions. The cottages are simple modern structures with the front wall almost all glass windows and door. With the curtains open you don’t have privacy but you do have a sightline to the sand and blue water. You can also enjoy the view from the small front porch. The rooms themselves are a square white box with brown tile floor and they’ve squeezed in a bedside table, large mirror, wardrobe, desk, fridge, wall-mounted flat screen TV and shoe rack. Rooms have an ensuite bathroom as well as air-con, fan and WiFi. Just behind the sea view rooms are the garden view ones, which are more bare basic and uninspiring. The room we inspected smelled damp but if you aren’t willing to splurge on the sea view, this still puts you very close to the beach and the bathroom is new and large. The standard rooms at the back are in an older building. Interiors are better than you would expect from the shabby exterior – rooms are slightly worn around the edges yet still decent. At more than half the price, these seem like better value than the garden view room. The hotel has a seafood restaurant which keeps most of the staff busy. No English is spoken. The beach that runs alongside the town is not Con Dao’s best but it’s fine for a dip and to watch some of the boats come in. Check rates at Thien Tan Star Hotel on Booking.com. Room: Superior double room, low season: 1,000,000 dong, high season 1,000,000 dong. Notes: Garden view. 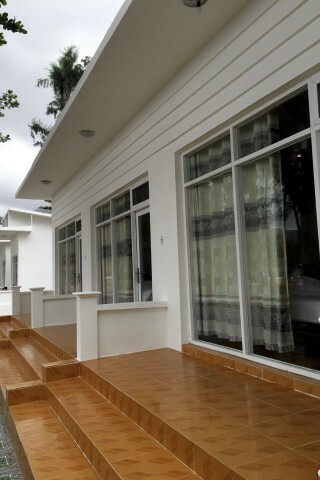 Room: Deluxe double room, low season: 1,200,000 dong, high season 1,200,000 dong. Notes: Sea view.